At this Roma's Hospitality Centre wedding, the bride and groom allocated two hours for the photoshoot. That gave us enough time to create splendid wedding day portraits of the newlyweds and the bridal party. This album spread includes two fun images of the bridal party. The photo on the left captures a bridal party huddle. To create this image I laid on the ground and asked the bridal party to form a circle around me and to bend. 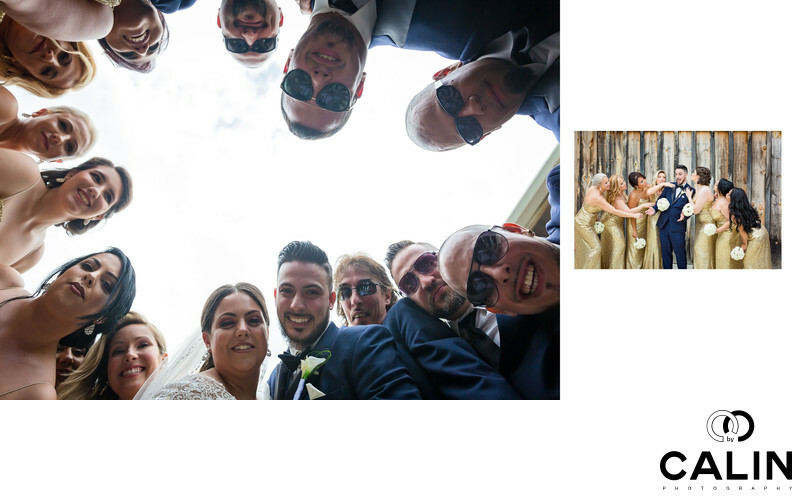 This resulted in a symmetrical image with the bride and groom positioned at the bottom of the frame and the rest of the bridal party forming a circle around the edges of the picture. The main challenge of taking this image was setting the right exposure in a short period of time so that the bridal party does not get bored. Also, the fact that I was shooting against the sky was causing a drop in the scene contrast. As a result, I had to adjust the contrast in post production. The image on the right portrays the groom surrounded by the seven bridesmaids. It is a symmetrical image where the groom is the centre of attention and is placed in the centre of the frame. I asked the bridesmaids to kiss and touch the groom, which led to some hilarious moments. Some of the bridesmaids are giving the groom air kisses, some others are trying to strangle him and finally others are laughing hysterically. In post processing I increased the vibrancy of the colours and added a slight vignette.